Have you ever heard a Bible interpretation or a scientifically-based argument that just didn't seem correct? Did you wish you knew how to show that it wasn't true? In a postmodern society, Christians are increasingly confronted with assertions that contradict the principles they believe. They need to be able to critically analyze arguments and know how to refute, in a gentle way, those assertions that are not true. In order to do this Christians need three sets of skills: -hermeneutical skills -- to know how to accurately interpret God's Word and be able to correct misinterpretations of Scripture; -research design and statistical skills -- to be able to examine statements about God's world and evaluate whether or not they represent valid conclusions from the data; -knowledge of logical fallacies -- in order to be able to identify when invalid inductive or deductive conclusions were being drawn, either from God's Word or from research studies about God's world. This book will help you be able to do the following: -know and use valid hermeneutical skills; -understand research design and statistical analysis techniques; -recognize logical fallacies and replace them with accurate analyses. An excellent resource for pastors, Sunday school teachers, and group leaders, this book is as practical as it is valuable for persons who want to discern truth and refute error in a spirit of love. Henry A. Virkler has been training Christian counselors for more than thirty years: fifteen years at the Psychological Studies Institute in Atlanta, five years at Liberty University in Lynchburg, Virginia, and since 1996 at Palm Beach Atlantic University in West Palm Beach, Florida. His other books include 'Hermeneutics: Principles and Processes of Biblical Interpretation', 'Speaking the Truth in Love: A Christian Approach to Assertiveness', 'Broken Promises: Healing and Preventing Affairs in Christian Marriages', and 'Choosing a New Pastor'. 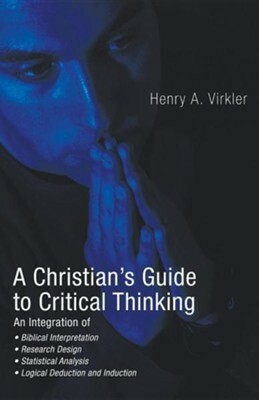 I'm the author/artist and I want to review A Christian's Guide to Critical Thinking.